Those shaggy-maned grape vines you see around the valley haven’t been ignored, they’re actual serving a purpose. 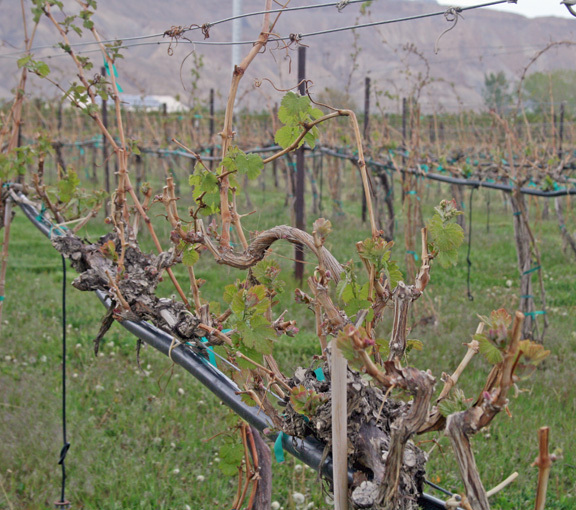 It’s bud break in the Grand Valley, a time when most of the valley’s grape growers finish pruning their winter-long vines on the bet those still-tender roseate buds will survive anything Mother Nature might throw their way. However, with this spring a series of warm/cold, then warm-and-cold again fluctuations, nobody’s quite sure how to prune, which means growers are leaving some vines undocked until it’s known with certainty which plants survived the winter cold. Bud break normally occurs irregularly around the region, spread out among the many micro-environments and grape varietals dotting the area, but this year, what’s normal? When bud break starts, though, it seems to happen overnight. The first rush of growth comes quickly; vines that were winter-dormant Monday will have swollen buds Tuesday and tiny green leaves Thursday. “It really happens fast, once it gets started,” said Nancy Janes of Whitewater Hill Vineyards, walking last week through the vineyards near her winery on 32 Road. Some of the canes (branches) in her vineyard are whiplike and long, flocked with bits of green from emerging leaves and mini-clusters, all a bit of insurance to protect the buds closer to the main stem, she said. The vines are apically dominant, which means the end bud releases a chemical (auxin) that retards the development of lateral buds closer to the stem. If the apical bud is removed, the other buds start to grow. Controlling the growth of those lateral buds through careful pruning is how grape growers control their vines and also how bonsai trees and espalier (growing a plant two-dimensionally against a wall) are created. Topiary is the three-dimensional version. Think of those Mickey Mouse trees at Disneyland and you get the idea. Tomatoes are not apically dominant, which is why they spread out instead of up. This widening eliminates competition by creating a cleared area around the plant. Cutting the apical buds spurs growth in buds closer to the trunk or stem but once buds break dormancy they are more-susceptible to frost. Historically the average last day for frosts in the Grand Valley is May 13, a comment that brings a laugh from my friend Neil Guard. “Yes, but Mother Nature doesn’t read the calendar,” said Guard, who grows grapes and peaches on his farm and vineyard on East Orchard Mesa. The name “tempranillo” comes from the Spanish world for “early” but you’d never know it by looking at Guard’s vines. While nearby rows of cabernet franc ware flush with new buds and leaves, the rows of tempranillo are showing slight signs of life and he’s purposely left those vines long and wild until he sees what grows. He sighed and stood up to survey the rows of vines.